After their amazing debut It’s Medication Time, in 2006, I was a little disappointed in the follow-up second album, a couple of years later. They had replaced their amazing guitarist Lewis Turner with a young talent that did not float my boat, excactly, to handle the guitars on their second Voiceprint label CD, The Truth About Us. 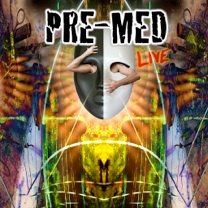 Well, in 2013, it looks like Pre-Med have taken their prescribed LSD tabs since, and come back in full form with Alan Davey and Danny Thompson from Hawkwind doing all the bass and battery, like on It’s Medication Time, the original Pre-Med 2006 mindblowing artifact of a Spacerock CD. I reviewed this album very favourably for the norwegian newspaper “Gateavisa” in 2007 as well as playing Man Eggs From Mars on my FM Radio show for the Christmas 2006 special I hosted. Now then, here are two fine examples of a band that Danny Faulkner from the band Starfield, who put out a fine Hawk-ish debut CD, some 10 years ago, and later went on to form Pre-Med to great success mid way through the Millenium’s first decade. So here I have the Live CD and “Einstein’s Day Off” CD proper studio album to review. 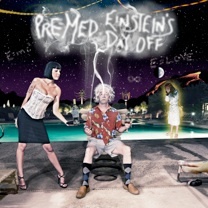 For one, Einstein’s Day Off is very psychedelic both lyric-wise and music-wise. Alan gets to rawk his beefy bass solos in breaks of spaceyness with metallic guitars chugging on choppy riffs in the background. The songs flow nicely. Abit of Acid manefesto and current Science references to God Particles and Big Bang Theory, and such, and to Tabs of LSD, and all medication you need for a New Age. Alan’s bass is very dominant, and the guitarist from The Truth About Us, Eamon O’Neill has amply, and for the better, been replaced by Phil Oates. Actually, Eamon does some tasty work on the Live CD so I would not slag him, but I did not like his work on The Truth About Us. Both discs chug away like Trio-era Hawkwind, with those nice electronic bits as breaks or as guitar / bass added FX, the way Hawkwind used to do in the early 90’s, and still do to an extent (not so much anymore as Hawkwind have Tim Blake handling synths, so Dave or Niall needn’t trigger synth sounds from their guitars) I would assume. Alans presence with his monsta bass could very well make Pre-Med a project much like his Bedouin or Gunslinger bands, in fact it is because Alan and Danny being involved in the first Pre-Med CD, I bought it and was blown away, yet had it not been for the Faulkners, Martin and Danny, handling lyric writing, and singing, in that order, so to say, if Alan did vocals and songwriting, which he does not, it would be a lot like a new Bedouin with Thompson. He is merely the bassist though, much like his work with The Meads Of Asphodel. The Live disc has material from the first two Pre-Med CDs and clocks in at just under 30 minutes with 5 songs. These CD’s are self released and feature the fine artwork of Kevin Sommers who has provided his talents on Alan’s solo stuff as well. Often, being an artist myself, and having created CD covers for a few bands, I find Sommers work to be mindblowing but much too cluttered and over worked digitally in some cases, but not always. It gets abit tedious, to look at. Like composition? Out the window dude! But it works for these bands very well, they all seem to think so, as well as the fans too, anyway. And I agree 80%. I generally don’t like medication BTW. At least not the kind given to me by men in white coats!